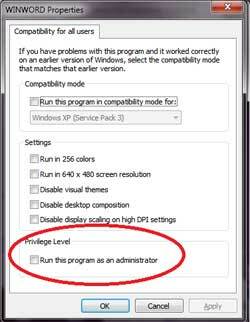 Right the program icon or the shortcut of the application and open the Properties box for that program and click the compatibility tab. 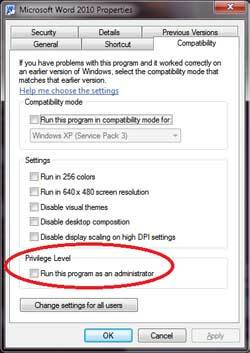 In this Dialog box can not only set “Run this program as administrator”, but you can also specify some additional settings to allow older programs to run in Microsoft Windows 7. These settings can be useful if you are trying to use an older program and it is not launching properly. The first item to try is setting the “Run this program in compatibility mode” and selecting Windows XP (Service Pack 3). Some older programs cannot function properly when presented with the new advanced display and video options in Windows 7 and Microsoft Windows Vista. To resolve these types of issues try adjusting the various options under the “Settings” section. In this dialog window you can adjust all the same settings for rights, operating system and the video options, but in this case the changes will affect every user that longs into the computer. For businesses in LA and OC needing network support, remember that ANC offers same day service, scheduled maintenance appointments, and emergency calls. As our client, your company’s network is our top priority. ANC performs routine maintenance, software updates, and system upgrades as part of your network security. Advanced Network Consulting has been servicing clients throughout Southern California for nearly 20 years. We’ve seen every form of viruses out there and our techs are constantly educating themselves on the latest threats and tactics. With two offices strategically located in La Mirada to serve Southeast LA County and North Orange County, and an office in Irvine to service South Orange County, same day appointments, scheduled maintenance and remote access appointments, phone support, and emergency calls are available 7 days a week.